The film Schindler's list directed by Steven Spielberg based on Thomas Keneally's Schindler's Arks tells the story of an entrepreneur and womaniser Oscar Schindler. 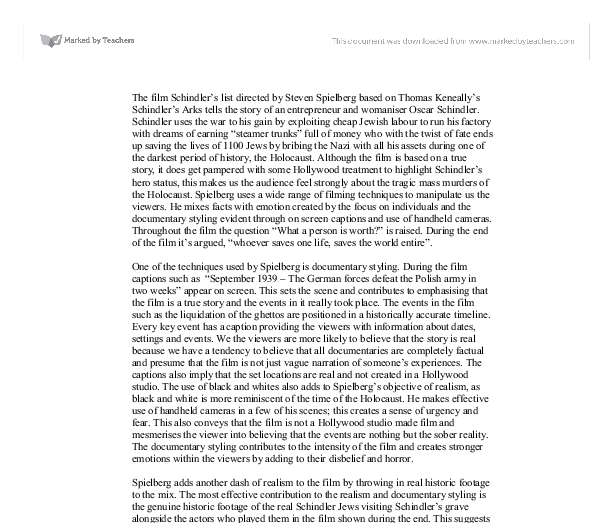 The film Schindler's list directed by Steven Spielberg based on Thomas Keneally's Schindler's Arks tells the story of an entrepreneur and womaniser Oscar Schindler. Schindler uses the war to his gain by exploiting cheap Jewish labour to run his factory with dreams of earning "steamer trunks" full of money who with the twist of fate ends up saving the lives of 1100 Jews by bribing the Nazi with all his assets during one of the darkest period of history, the Holocaust. Although the film is based on a true story, it does get pampered with some Hollywood treatment to highlight Schindler's hero status, this makes us the audience feel strongly about the tragic mass murders of the Holocaust. Spielberg uses a wide range of filming techniques to manipulate us the viewers. He mixes facts with emotion created by the focus on individuals and the documentary styling evident through on screen captions and use of handheld cameras. Throughout the film the question "What a person is worth?" is raised. During the end of the film it's argued, "whoever saves one life, saves the world entire". One of the techniques used by Spielberg is documentary styling. During the film captions such as "September 1939 - The German forces defeat the Polish army in two weeks" appear on screen. This sets the scene and contributes to emphasising that the film is a true story and the events in it really took place. The events in the film such as the liquidation of the ghettos are positioned in a historically accurate timeline. ...read more. In these two scenes we see Schindler respond positively and Goeth negatively to the situation. Spielberg intention here is to lead us to compare Goeth and Schindler and realise the fact that they both come from the same background yet make different choices not only in this particular scene but throughout the film. Spielberg wants the audience to see the effect one person can have whether it is positive or negative. Throughout the film we see these comparisons, for example when two scenes are juxtaposed together where Schindler is picking a secretary and Goeth is picking a maid. Further comparisons are evident through the character of Goeth and Schindler. Goeth is shown urinating and sometimes badly dressed whereas Schindler is always immaculately dressed and never shown urinating or doing anything bad. The contrast between the two makes us fond of Schindler and therefore makes us feel strongly about the historical events. Other comparisons are evident in general between the good and the "evil". In the film the Nazis speak in German and all the Jews and Schindler speak in English. The film is in English and aimed at English understanding audience. 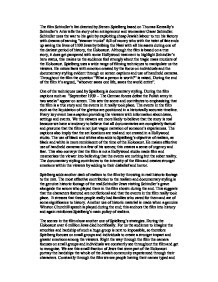 We know English and know what the Jews and Schindler are saying, we know and understand them better and therefore can sympathise with them. On the other end of the spectrum the Nazi mostly speak and shout in German, especially when doing something bad or sinister such as burning Jewish bodies. ...read more. The lists display the sheer scale of the Holocaust. We see thousands of people lining up at the Ghettos to register and having their names typed, gaze at thousands of faces and hear many names. The lists are signs of the apocalypse and re-birth. Get your name on one of them and you survive, have it on another and you die. This is significant when Stern is put on a train to be sent off to the death camp before Schindler saves him. This displays to us the little importance for Jewish life and the power of beliefs. This shows us how casual and random the killings were. The result of this is that the audience feels strongly for the Jews that die and is overwhelmed by the number of people that died. The film influences the audience strongly by displaying the authenticity and tragedy of the Holocaust to them through the use of numerous strategies implemented into the film by Spielberg. These strategies heighten the emotions we experience and make us feel sympathetic towards the Jews. The documentary styling shown through captions and use of handheld cameras is one of many examples of the efforts made to make the film seem a true story and authentic. Spielberg's story of the Holocaust has strong impact on us and steers our opinion in favour of the Jews that died in the Holocaust through the use of many technical and non-technical film making techniques and strategies. It is clearly displayed that one person can make a difference. By saving 1100 Jews Schindler ensured generation and displayed the sheer power of a sympathetic mind. ...read more. Much of the bullying is directed towards Donald. In the scene that we first looked at Audrey and Angela started being very friendly towards Donald. They are playing 'families' and Angela has a doll. This doll is being used by Angela to get Donald on her side. guns, yet it cannot deal with two children who decide to kill their own school pupils. Further into the scene, the actual CCTV footage of the shooting is shown. The two killers are highlighted with a ghostly aura, which has been done by the police and not by Moore. Also this is reinforcing that we are all human, and so were all the characters in the play. The irony involved is that the evil, deceitful man, Richard Rich, died in his bed and he didn't really deserve to, which gives out the message that life isn't necessarily fair, so don't take it for granted. For example when she says 'Poor, poor Donald' her tone is soft and her arm is around him. However, at the end she becomes loud and harsh when she is mocking Donald. This demonstrates that her character is very fickle and will simply follow the others.